Welcome Friends to another fabulous FRIDAY FEATURE (#ssmfeatureme). 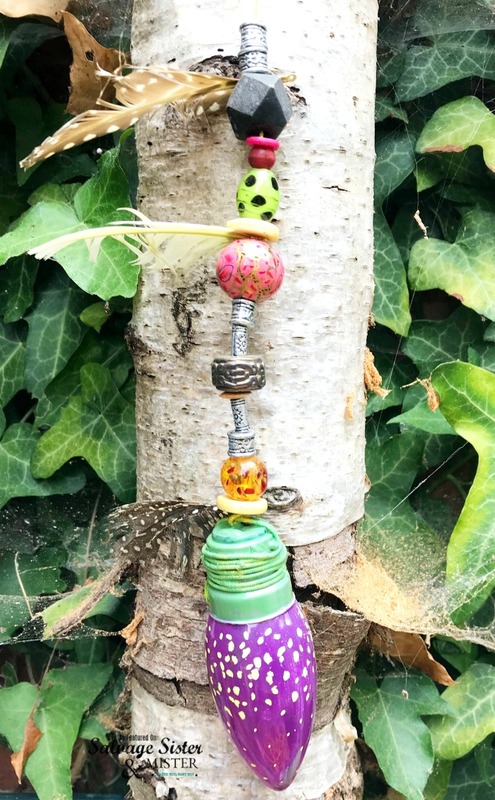 Today, we are welcoming Ally from The Peculiar Pear with an upcycle project that not only makes use of old light bulbs but also old nail polish and thrift store necklaces too!!! 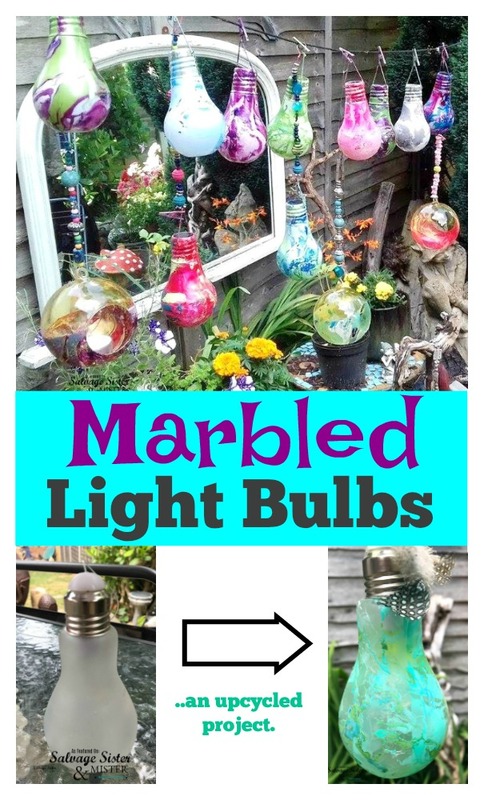 Here’s Ally to share how to make these for your garden. 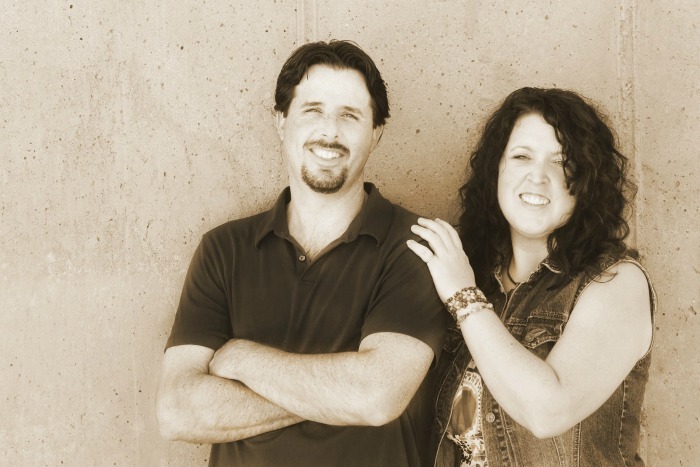 “My name is Ally, and I’m a single mum who has realized other people’s rubbish can be re-used and given new life. 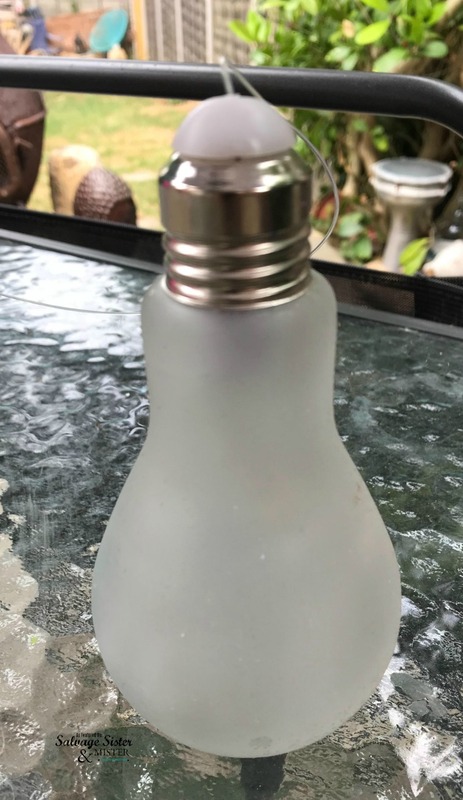 I recently switched to energy saving bulbs and thought the old shape ones were cool. Using left over nail varnishes, and knew they were oil based so with a little memory from learning marbling at school, it all came together. 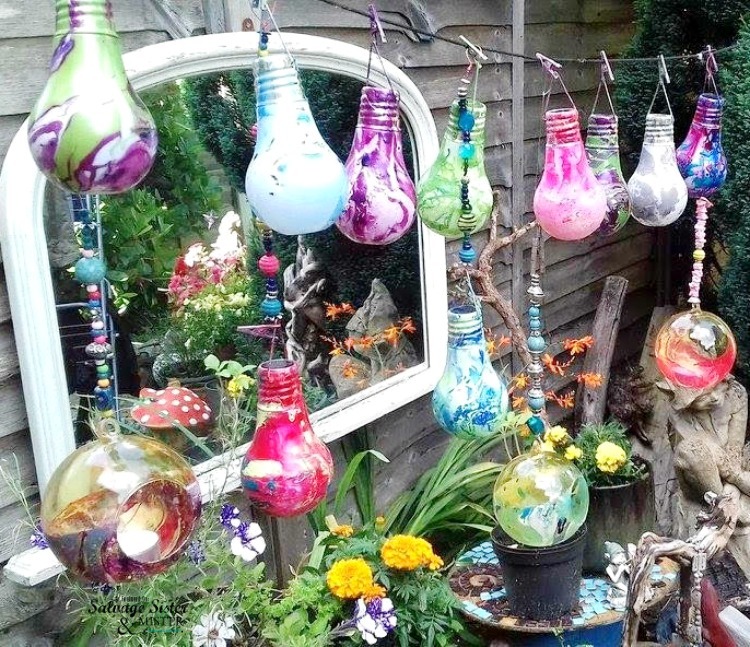 There is a mix of old light bulbs in this garden display. To make them even more beautiful, I added necklace beads from some charity shop. Decorate as you like, beads and such, and add hook/clasp so you can hang to dry. Add your choice of colored nail varnish/polish (it will separate and float on top of the water). You will only need a drop of each color to start with. You can use a toothpick to move the colors around a bit to get the marble look. Roll the light bulb on the surface of the water. Place in your garden as you like. To do a garland, you would just clasp the bulbs to a wire or string. Don’t these just make for such a beautiful upcyled yard decoration? A hige thank you to Ally for sharing them. Don’t forget to check out her page to see more creations. 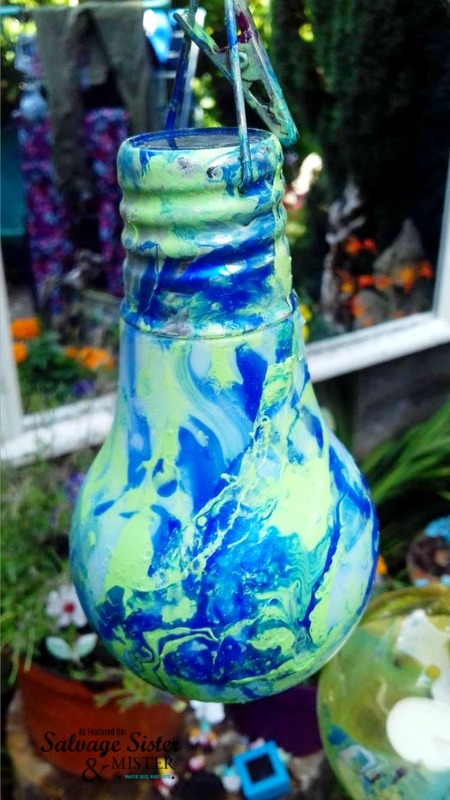 Now, if you decide to make some marbled light bulbs, we would love to see them. You can tag us on Instagram or share your projects on our weekly SHARE DAY thread on Wednesday’s over on our Facebook page. Are you interested in a possible feature here on our site? You can go to our SSMFEATUREME Page for more info. Michelle, I can’t wait to see what you do with yours. You are so talented. 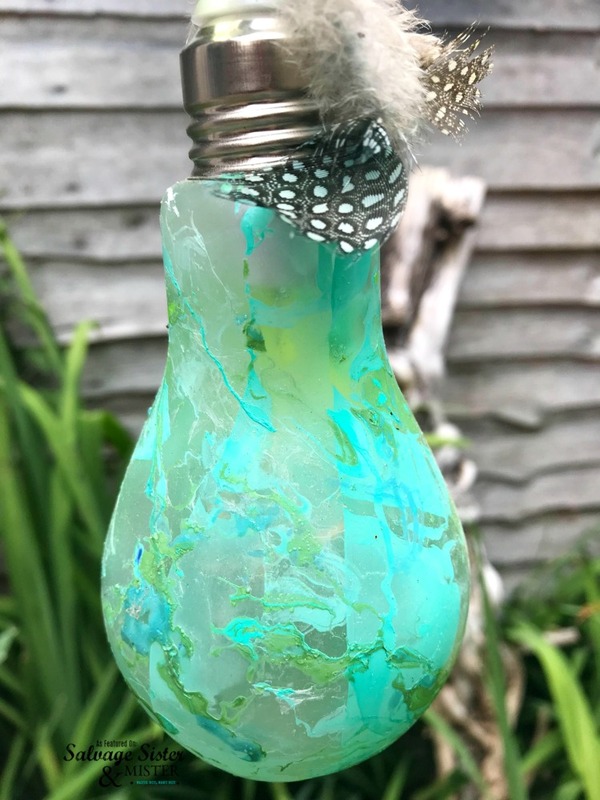 These are beautiful, and a fun way to upcycle light bulbs! I guess using nail polish should help strengthen the bulbs from breaking. I love this idea! Going to start saving bulbs. Linda, I bet you are right, the polish would help give them strength. These are gorgeous. What a clever fun idea, I love that you did them different colours. Claire, She really did an amazing job! Such a fun upcycle.